Q: Can you briefly explain how you started basketball? How was your experience on the basketball team in high school? A: I actually didn’t start playing basketball until I was 12 or 13 (which was late compared to most players in Portugal) – I was playing soccer before then. I only started playing basketball because my school had a team that practiced about once a week and I thought it would be fun to try it out. In Portugal, we don’t have competitive teams in school. If you want to play a sport, you have to find a club to play for. I played for the same team all throughout middle school, up until high school. Then after my junior year I was recruited to play for Mercersburg Academy in Pennsylvania, where I played for 2 years and won the state championship our senior year. In the beginning, I think the hardest part was to adjust to the different rules of the game, but I definitely didn’t mind the closer 3 point line. 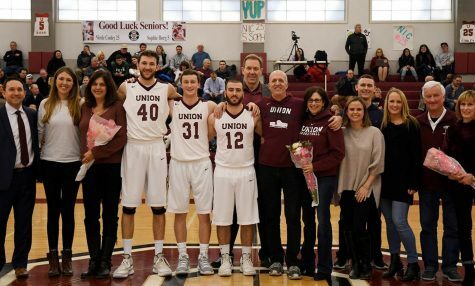 Q: How has your experience been playing at Union College and what are the differences between high school and college? A: My experience at Union has been pretty good! I enjoyed playing both freshman and sophomore year, but I think this season has been the best one so far. We have a great group and have a lot of fun playing together. I think the biggest differences are the speed and the physicality. I also think that it is a lot harder to play against teams that scout you and prepare for your games during the whole week – it makes the games a lot more competitive. A: It’s during our pre game warmup, I always get water after our team talk. It doesn’t really mean much, but it’s something I’ve been doing since freshman year and think gives me a couple of seconds to get my mind cleared of everything else and focus on the game. Q: What are your favorite things about being on the Union Basketball team? A: The biggest thing is that we are known for our academic performance, and it makes me proud to be part of a team that can do well on and off the court. Q: What has been the highlight of your athletic career so far? A: I am more of a defensive player than offensive, so I always base my performance on how well I did on defense. I think our last game against Bard has to be my best game so far. I was able to shut their best player down when I was on the court and I also contributed with 9 points myself. Q: What is one thing people would be surprised to know about the Basketball team? A: This year, half of our players are freshmen. Q: How do you think playing a sport has influenced your experience at Union? A: I need to be busy to perform well, academically. I think the biggest difference, if I didn’t have practice everyday, would be that I would just procrastinate all day and not get anything done. A: Burrito bowl from Dutch. Q: What is your favorite thing about Union? A: The close relationships you get to have with your professors due to the small professor-to-student ratio in the classroom. Q: What’s your favorite restaurant in Schenectady and why? A: Peter Pause for breakfast and Katie O’Byrnes. Just love the food! A: I want to help design airplanes for a job. Q: What are your interests outside of basketball? A: I love doing research on campus. I’ve been working in the Aerogel Lab since freshman year. Q: Who/ what serves as your biggest inspiration? Q: What are your goals for after graduation? A: I would love to start working right away but if that doesn’t happen I think I’ll try to go to grad school.